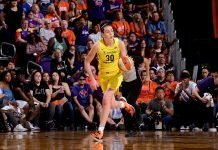 Los Angeles – The Sparks trailing by nine in the third quarter Thursday night, went on a 20-2 run against the Silver Stars to close out a 93-86 first-round playoff win. Kristi Toliver, who was named the league’s Most Improved Player of the Year prior to the game, lead the Sparks with 29 points. Candace Parker had 25 points – 10 of which were in the fourth quarter, and nine rebounds, while Nneka Ogwumike put up 12 points, including nine in the third period. Becky Hammon lead the Silver Stars with 19 points, while Danielle Adams added 17. Los Angeles got off to a slow start, and fell behind by as many as 10 points in the third quarter before an Ogwumike driving reverse layup seemed to ignite the team. A driving Parker layup to end the third quarter put the Sparks within two points, and they took the lead for good at the fourth period 7:07 mark. Sparks Coach Carol Ross said that as her team has done in the past, they came out sluggish. Parker sat out a good portion of the third quarter, and she knew why. She made a key observation about the Sparks. “Honestly I’d rather take our team down 10 than up 20 because we like to fight, and we kind of get complacent when we get ahead. I think we did a good job of recognizing what we needed to do, and play through it. The key thing that sticks out in the second half is we just killed in the paint, and that’s where we need to live. We don’t need to settle for jump shots – we need to go to the basket,” Parker said. Toliver took some positives from LA’s response to being down. Silver Stars Coach Dan Hughes said the key to their loss was their ability to get to the free throw line only 11 times. The Sparks travel to San Antonio for Saturday’s game two, at noon Pacific/3 p.m. Eastern. Toliver wins Most Improved Player Award.